When Grantland Rice wrote “When the One Great Scorer comes, to write against your name,” he must have meant the Elias Sports Bureau. The statistics gurus there advised the official scorers for Game 7 of the World Series that the victory they initially credited to Madison Bumgarner should be changed to a save. The victory was ultimately credited to Jeremy Affeldt, the pitcher of record when the San Francisco Giants scored the go-ahead run in the fourth inning. The scorers rendered the final decision 50 minutes after the final out. 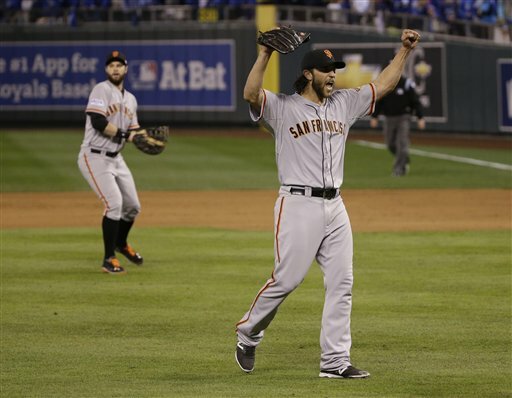 Bumgarner, named the MVP of the Series, did set a record with his five-inning stint, as it became the longest save in World Series history. Affeldt relieved starting pitcher Tim Hudson in the second inning and threw 2 1/3 scoreless innings. The previous longest save in the World Series since 1969, when that statistic became official, was by lefty Steve Howe, whose 3 2/3 innings in the sixth game of 1981, helped give the Los Angeles Dodgers their victory over the New York Yankees. Before the statistics became official, Philadelphia Athletics ace Lefty Grove threw 4 1/3 innings in Game 2 in 1929 against the Chicago Cubs. The only pitcher other than Bumgarner to record two wins and a save in a World Series was Rawly Eastwick of the Cincinnati Reds in 1975 against the Boston Red Sox. Affeldt is on the verge of a record of his own; he has hurled 22-straight scoreless innings in the postseason. Yankee Mariano Riveraholds the current record at 23 consecutive scoreless innings.